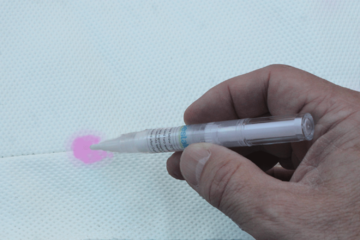 PinkAway™ Home is a permanent solution for Pinking on your boat’s vinyl cushions. It consists of an innovative, self contained cartridge which contains a patented chemical agent that when applied over five coats, in direct sun light, will permanently eliminate your boat’s Pinking. It’s that simple. Traditional cleaning products are ineffective against Pinking because they are applied to and only function on the surface of the cushion. However, Pinking stains originate from inside the cushion. The Home Solution agent is designed to go all the way through the vinyl and harnesses the power of the sun to eliminate Pinking.